While season seven of Showtime's critically acclaimed serial killer drama (I prefer serial killer comedies) Dexter doesn't start until Sunday, the Facebook app that allows fans to play episode-specific trivia is already alive and kicking. 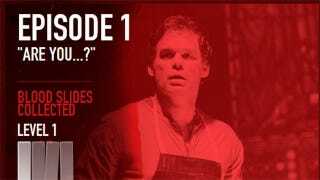 Challenging players to answer questions about lines spoken and actions taken during the first episode of season seven, "Are you...? ", Dexter's Disciples right now is an excellent way to spoil key moments of the show for yourself. By answering questions, correctly or incorrectly, you can sort of piece together what's going to happen on Sunday. So you might want to hold off. Besides, getting questions wrong means you don't unlock blood slides that lead to exclusive content, and you'll be at a disadvantage on your friend leaderboard. There's no real reason for a low scorer not to be secured to a table with plastic wrap, just saying.